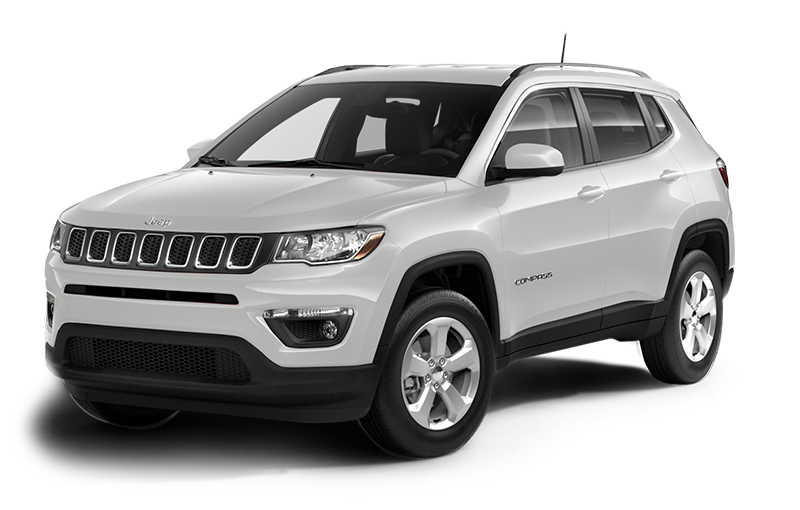 Best-in-Class 4x4 Capability Based on Jeep's sub-segmentation based on compact sport and cross utility vehicles including Chevrolet Trax, Mitsubishi Outlander, Subaru Crosstek, Hyundai Tucson, Kia Sportage, Mazda CX3 and Volkswagen Tiguan. 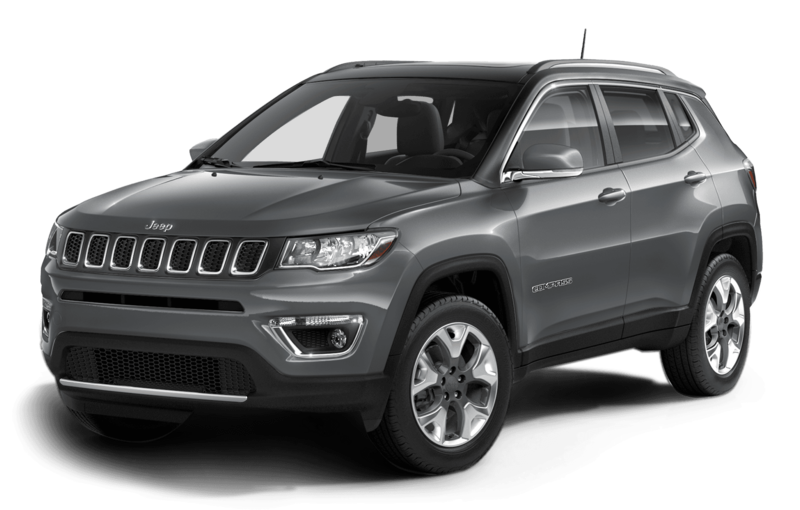 Best-in-Class 4x4 capability based on Jeep Active Drive Low 4x4 system and Best-in-Class approach angle, departure angle and breakover angle. 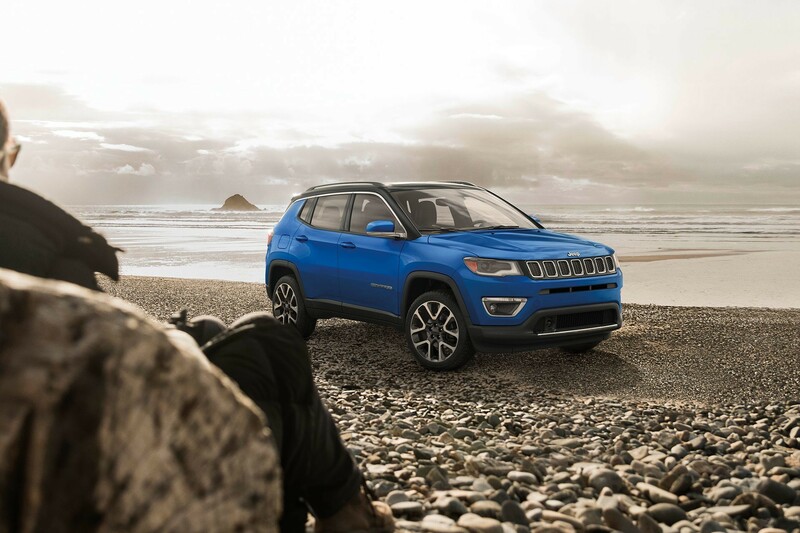 Sign up to receive exclusive offers & news on the Jeep® Compass . We appreciate your interest in the Jeep® Compass . Blind Spot Monitoring This is a driver convenience system, not a substitute for active driver involvement. The driver must remain aware of their surroundings and be prepared to take corrective action to avoid collisions. 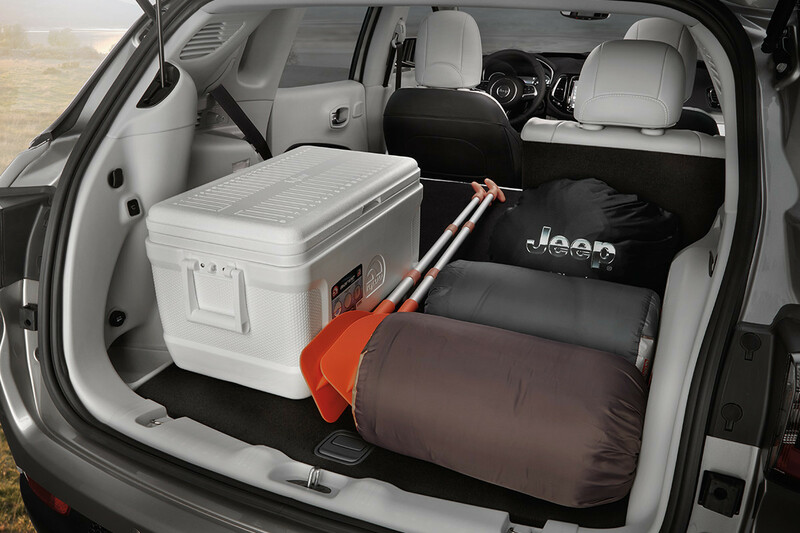 The 2018 Compass has plenty of cargo space no matter where your travels take you. 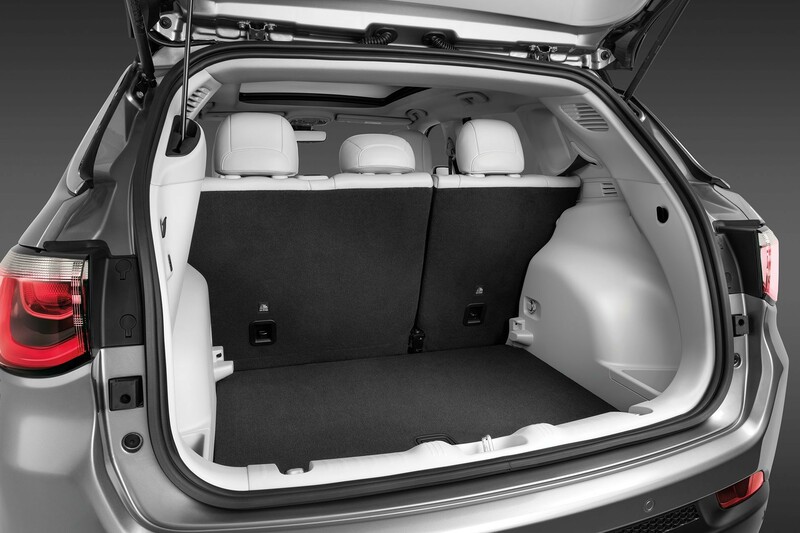 The fold-forward front passenger seat and 60/40 split-folding rear seats provide ample cargo space for your gear. 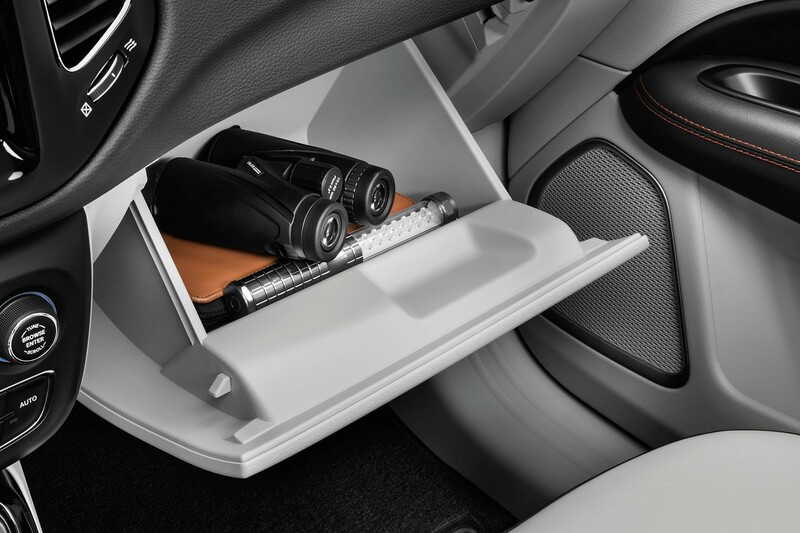 The available height-adjustable rear cargo floor lets you increase space for taller items when lowered, or raise it up for easy, slide-in loading. 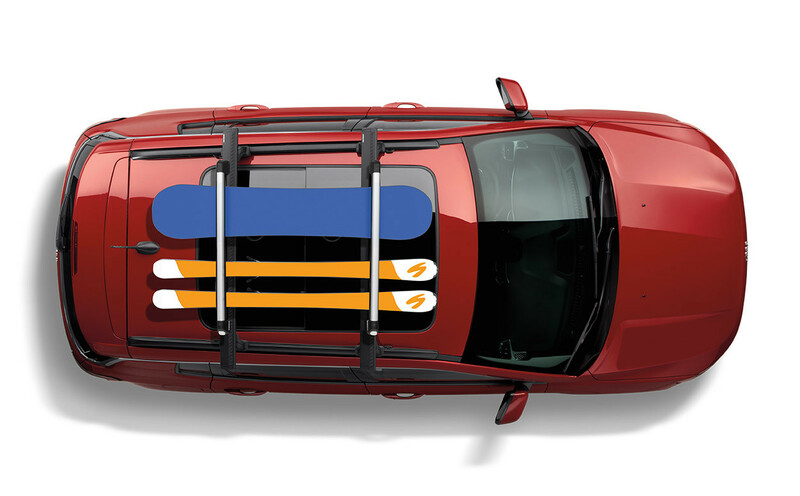 The available power liftgate provides easy access to the rear cargo area simply by pushing a button on your key fob. 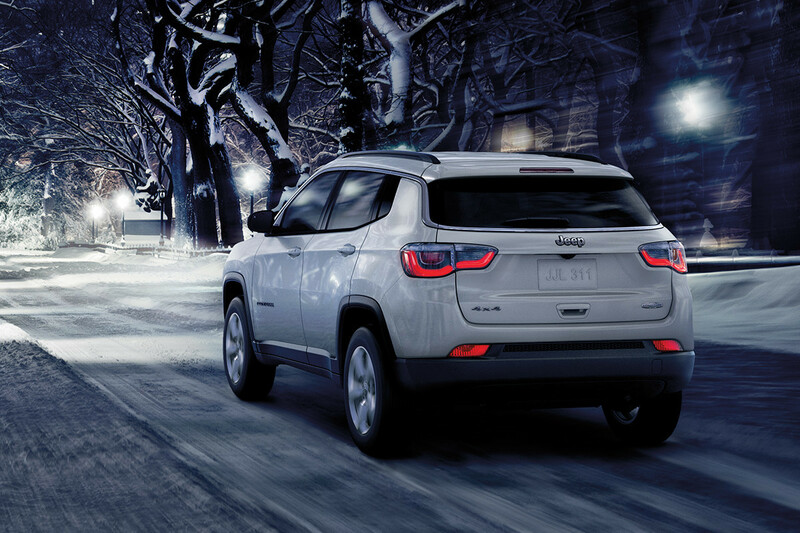 Keep your 2018 Compass cozy with the available Cold Weather Group. 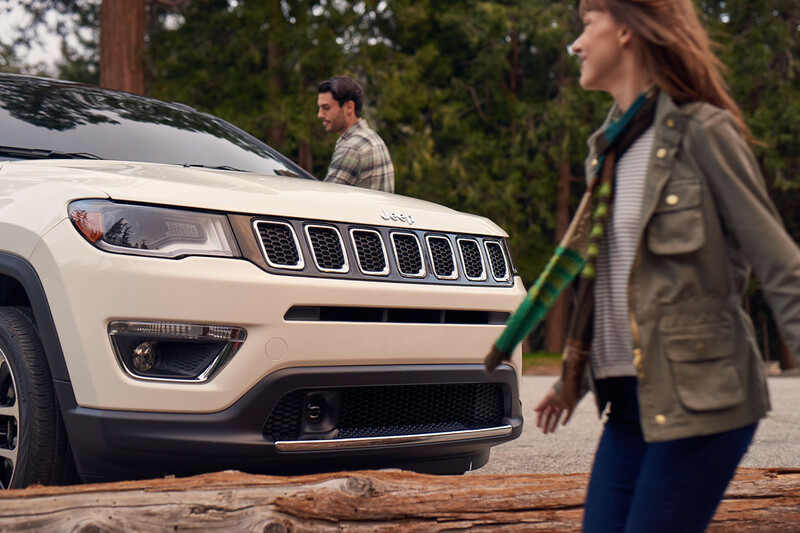 Keep your 2018 Compass cozy with the available Cold Weather Group. Snow-ready features include windshield wiper de-icers, all-weather floor mats and a washable, reversible cargo mat. 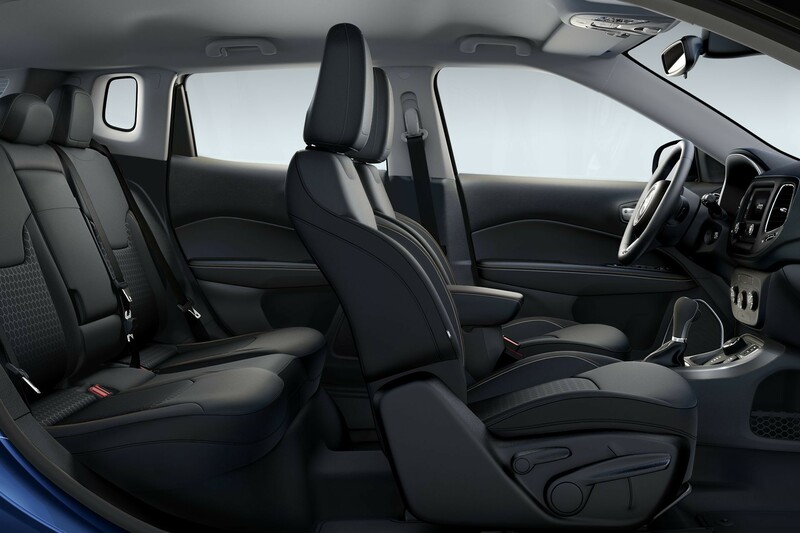 Hands and bottoms will appreciate the heated leather-wrapped steering wheel and heated front seats, respectively. 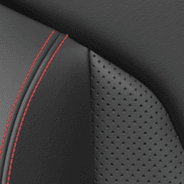 You can also warm the cabin prior to travelling by using the Remote Start feature (automatic transmissions only). It works from as far as 90 metres (300 feet) away. 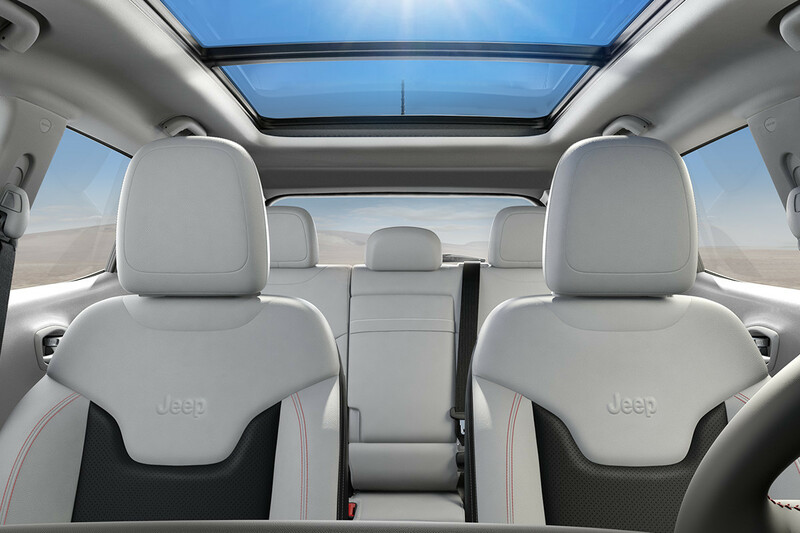 Take in the great outdoors with the available Dual Pane Panoramic Sunroof. Take in the great outdoors with the available Dual Pane Panoramic Sunroof. 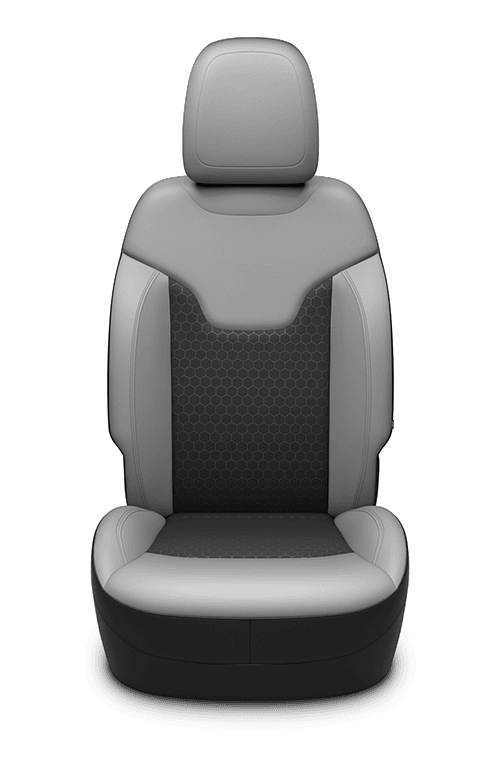 Passengers in all rows can enjoy an incredible wide view or adjust the sunlight with the power sunshade. 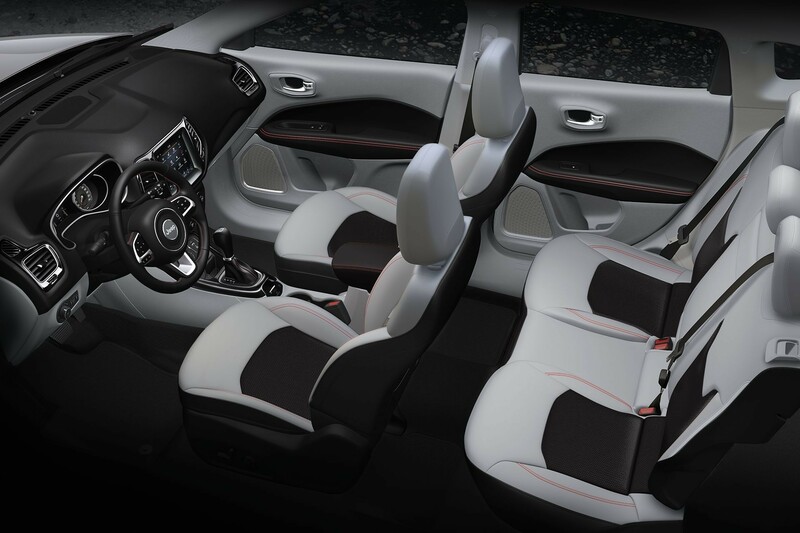 Available comfort features enhance the 2018 Compass interior experience. 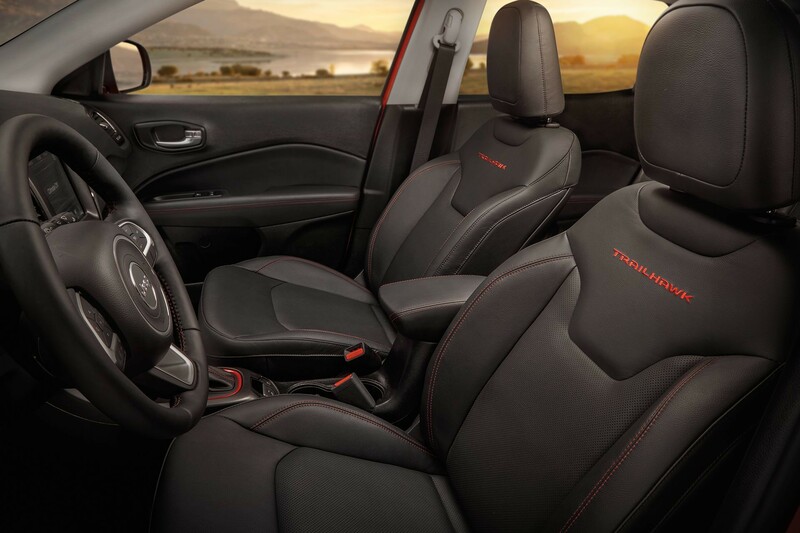 The standard heated leather-wrapped steering wheel in the Compass Limited provides welcome warmth on cold winter mornings. 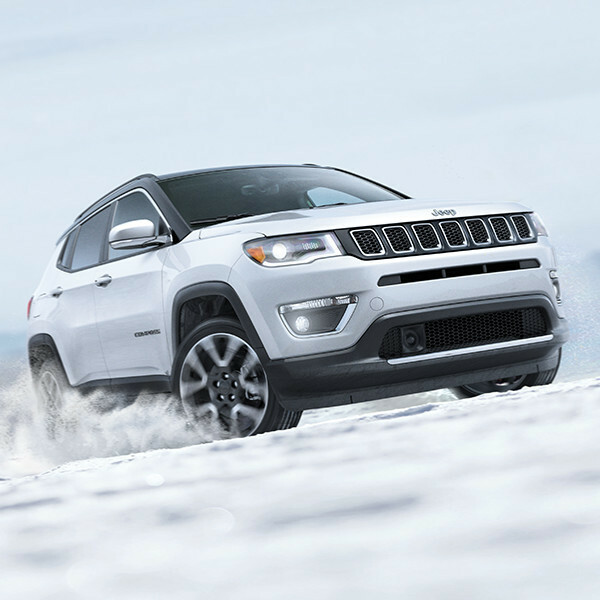 Available on Sport, North and Trailhawk® with the Cold Weather Group. 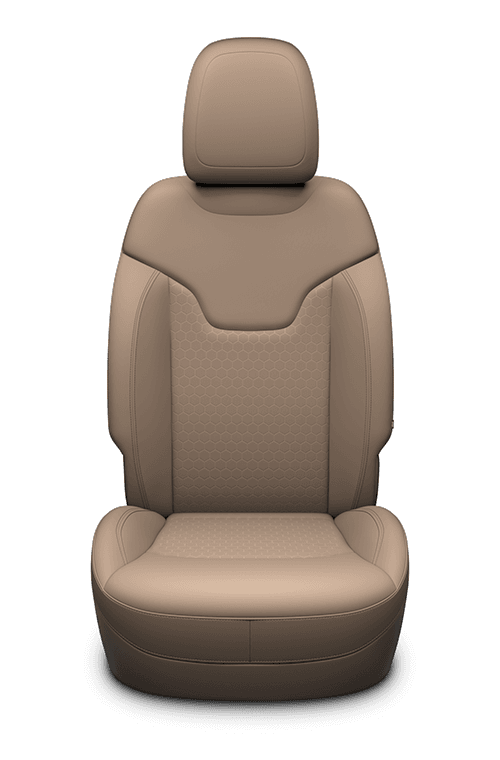 The Compass Limited also has heated, leather-faced front bucket seats. The 12-way power driver's seat with 4-way lumbar adjust supports a customizable seating experience. Safely check out vital vehicle data while keeping your focus on the road ahead. Safely check out vital vehicle data while keeping your focus on the road ahead. 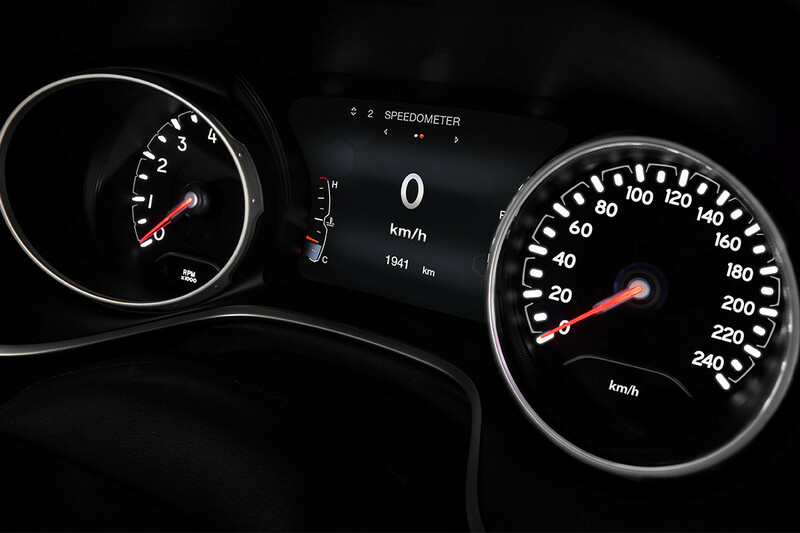 The available 7-inch, full-colour customizable in-cluster display presents real-time performance information within the instrument panel. Searchable data includes speed, fuel efficiency and tire pressure. You can also get details on available 4x4 capability features. The 2018 Compass offers new 4th generation Uconnect® multimedia systems. 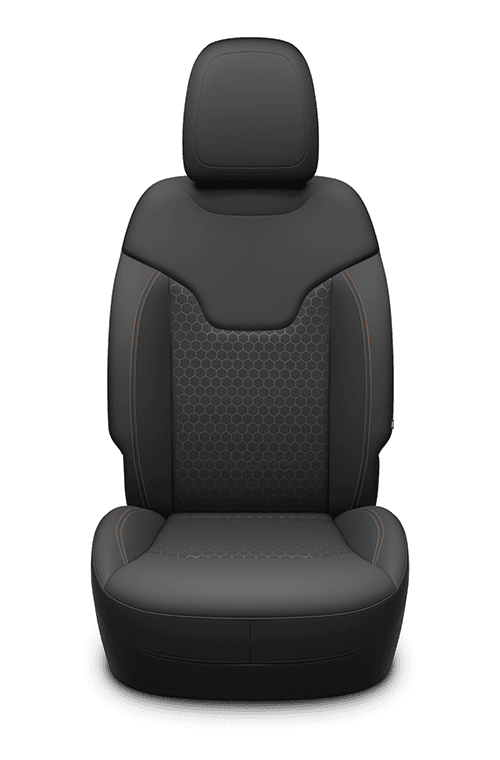 The 2018 Compass offers new 4th generation Uconnect® multimedia systems. 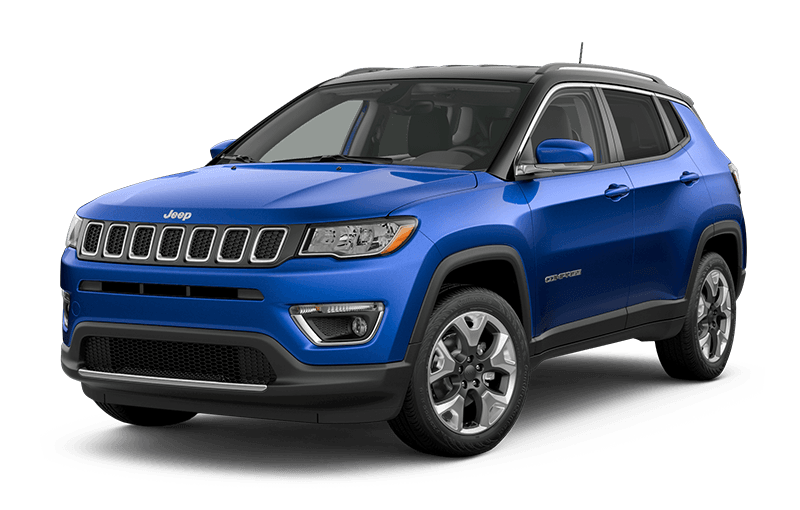 Available features include Largest-in-Class 8.4-inch touchscreen, Based on Jeep's sub-segmentation based on compact sport and cross utility vehicles including Chevrolet Trax, Mitsubishi Outlander, Subaru Crosstek, Hyundai Tucson, Kia Sportage, Mazda CX3 and Volkswagen Tiguan. 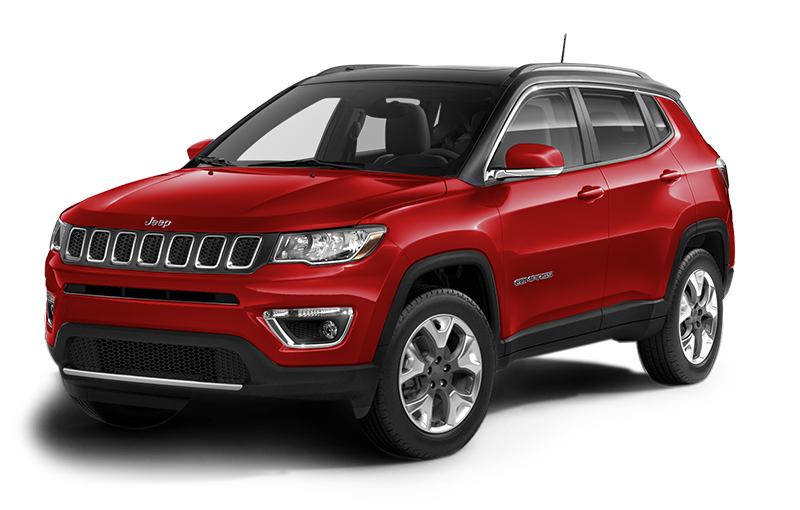 plus Apple CarPlay compatibility and Android AutoTM. Driving while distracted can result in loss of vehicle control. Only use mobile phones and other devices, even with voice controls, when it is safe to do so. 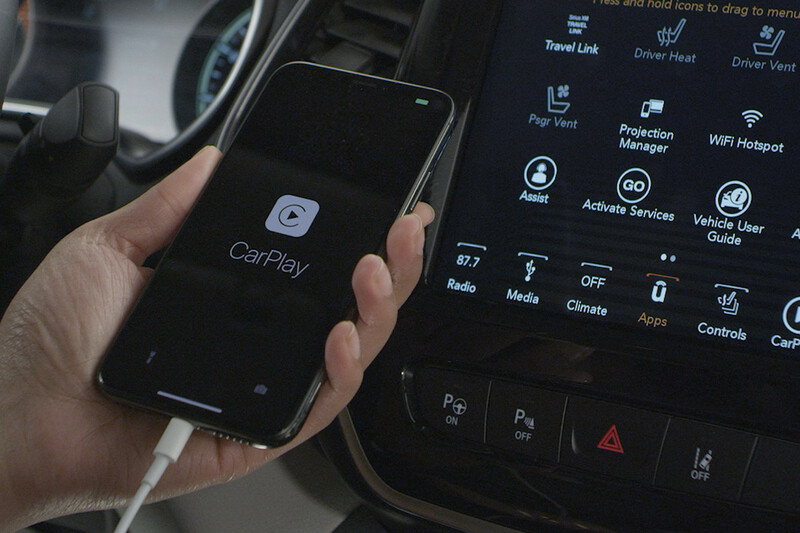 Apple CarPlay requires a compatible iPhone connected via USB cable to the Uconnect® system. Apple CarPlay is a trademark of Apple Inc. Data plan rates may apply. Android Auto requires the Android Auto app on Google Play and AndroidTM compatible smartphone running Android 5.0 Lollipop or higher. Android Auto is a trademark of Google LLC. Also available are new SiriusXM Guardian, All SiriusXM Guardian-equipped vehicles come with a 12-month trial effective on the date of purchase or lease of a new vehicle. Enrollment in the trial is required to receive service. 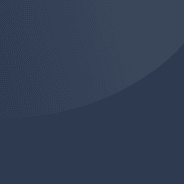 Upon expiration of the trial period, purchase of a subscription is required to continue SiriusXM Guardian. Services can only be used where cellular coverage is available. See Uconnect® and SiriusXM Guardian Terms of Service for complete service limitations. SiriusXM Traffic and SiriusXM Travel Link Requires SiriusXM Radio subscriptions governed by SIRIUS terms and conditions available at siriusxm.ca. (late availability). Get traffic alerts, updates on local fuel prices, push-button security features and other conveniences. 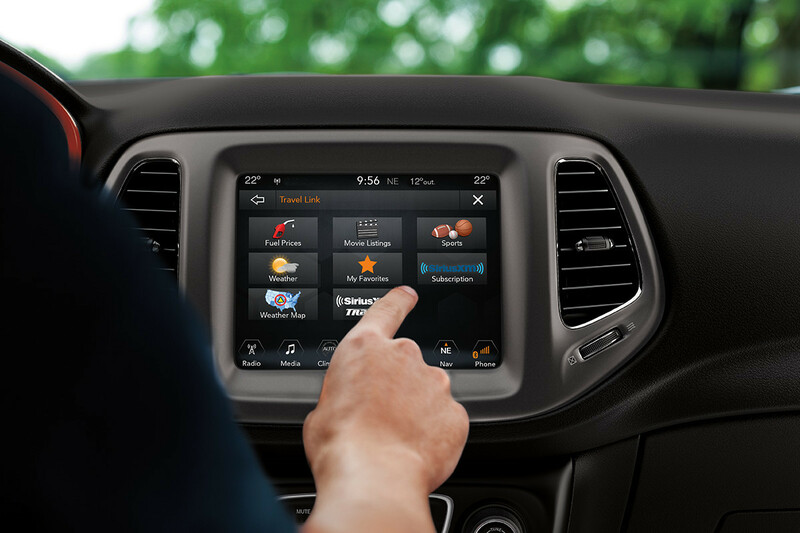 Available Uconnect® systems offer Apple CarPlay compatibility and Android AutoTM. Driving while distracted can result in loss of vehicle control. Only use mobile phones and other devices, even with voice controls, when it is safe to do so. Apple CarPlay requires a compatible iPhone connected via USB cable to the Uconnect® system. Apple CarPlay is a trademark of Apple Inc. Data plan rates may apply. Android Auto requires the Android Auto app on Google Play and AndroidTM compatible smartphone running Android 5.0 Lollipop or higher. Android Auto is a trademark of Google LLC. Available Uconnect® systems offer Apple CarPlay compatibility and Android AutoTM. Driving while distracted can result in loss of vehicle control. Only use mobile phones and other devices, even with voice controls, when it is safe to do so. 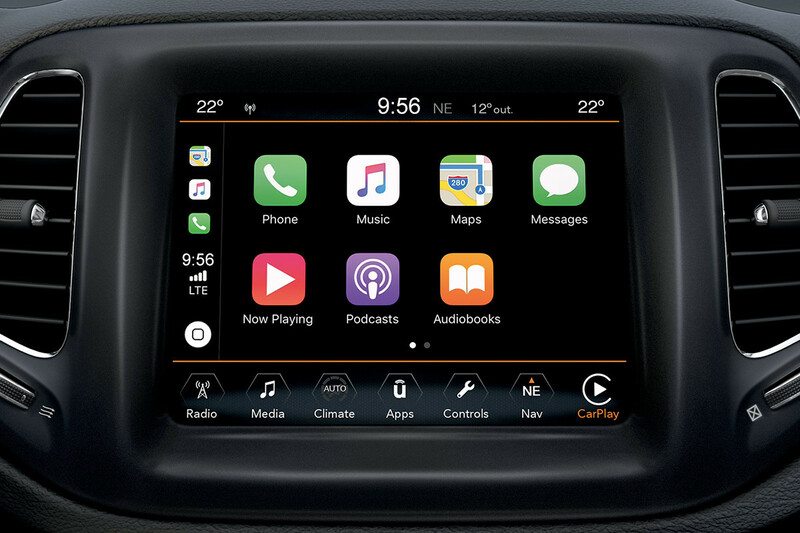 Apple CarPlay requires a compatible iPhone connected via USB cable to the Uconnect® system. Apple CarPlay is a trademark of Apple Inc. Data plan rates may apply. Android Auto requires the Android Auto app on Google Play and AndroidTM compatible smartphone running Android 5.0 Lollipop or higher. Android Auto is a trademark of Google LLC. Plug in your compatible smartphone and its features will appear on the Uconnect touchscreen. 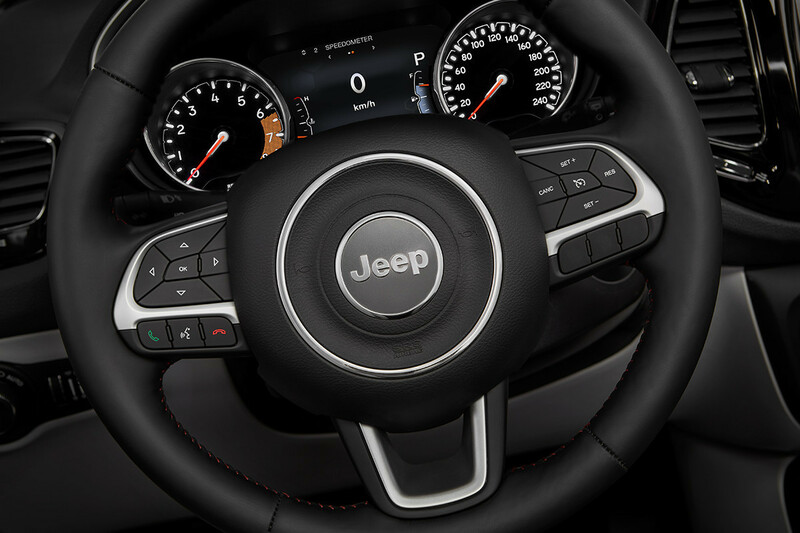 You can also access your phone using voice or the control buttons on the steering wheel. Connect your iPhone® to access Apple Music, Maps, Messages and more, plus use your voice to contact Siri. Plug in for easy access to Google Maps and Google Play Music. You can also make phone calls, and send and receive messages. 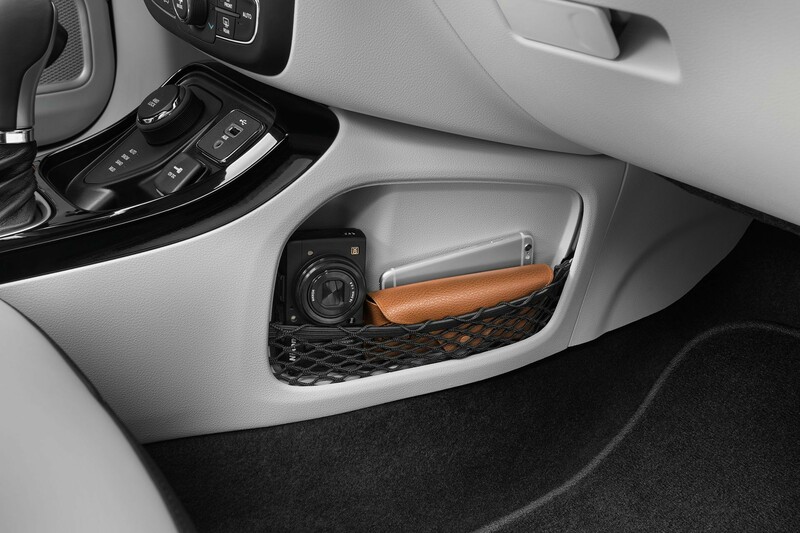 No more fumbling for keys while carrying groceries and kids. Power your drive with the Apple experience. Apple is not a sponsor of this promotion. Use your iPhone® to activate Apple CarPlay and listen to music, make calls, send and receive messages, and get directions Requires iOS equipped device. Visit www.apple.com/ca/ios/carplay/ for details. – all from the touchscreen of your Jeep® Compass's award-winning Uconnect® multimedia centre. Get up to six months of Apple Music. 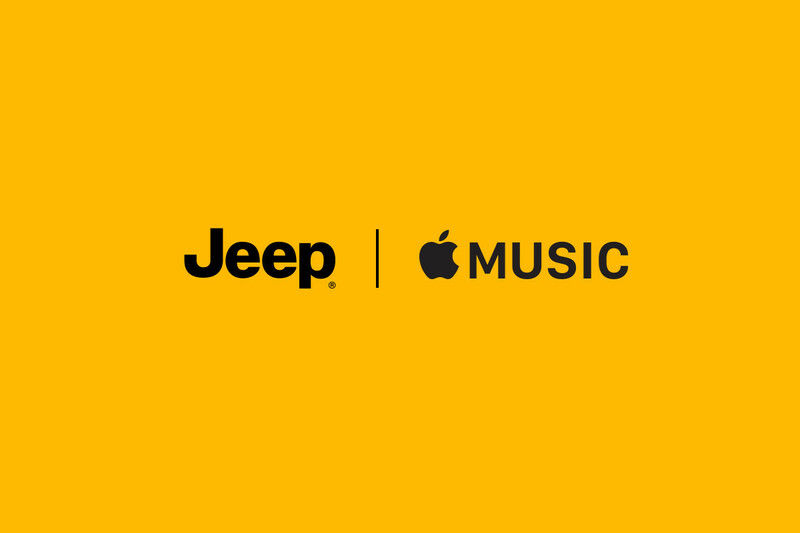 Offer for Apple Music in Canada begins May 1, 2018 to April 30, 2019 with retail purchase/lease of qualifying new Chrysler, Jeep, Dodge, FIAT and Ram vehicles. New Apple Music subscribers get 6 months free. Existing Apple Music subscribers get 3 months free. Not for resale and no cash value. Requires iTunes account. See dealer for details. Apple is a registered trademark of Apple Inc. Enjoy the ultimate in-vehicle experience when you buy a Jeep® Compass. Requires iOS equipped device. Visit www.apple.com/ca/ios/carplay/ for details. With Apple Music, you can stream over 50 million songs on all your compatible Apple devices Apple is not a sponsor of this promotion. without interruption, giving you a never-ending road trip playlist. Pearl White Tri-Coat Image for representation only. Not all colours and wheels are available on model displayed. Please see your dealer or visit Build & Price for full option details. Laser Blue Pearl Image for representation only. 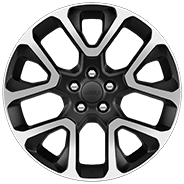 Not all colours and wheels are available on model displayed. Please see your dealer or visit Build & Price for full option details. Olive Green Pearl Image for representation only. 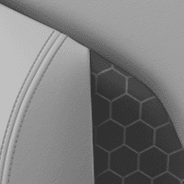 Not all colours and wheels are available on model displayed. Please see your dealer or visit Build & Price for full option details. 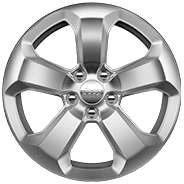 17-inch polished aluminum with Granite pockets Image for representation only. 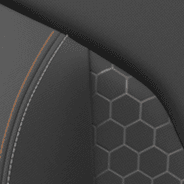 Not all colours and wheels are available on model displayed. Please see your dealer or visit Build & Price for full option details. 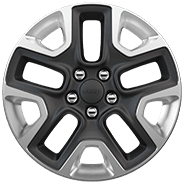 18-inch polished aluminum with Mid-Gloss Black pockets Image for representation only. 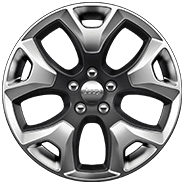 Not all colours and wheels are available on model displayed. Please see your dealer or visit Build & Price for full option details. 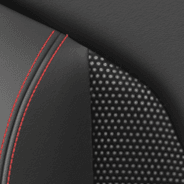 17-inch Mid-Gloss Black with polished pockets Image for representation only. Not all colours and wheels are available on model displayed. Please see your dealer or visit Build & Price for full option details. 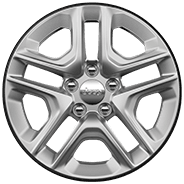 18-inch polished aluminum with Tech Grey pockets Image for representation only. 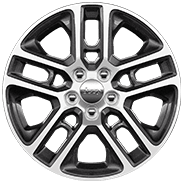 Not all colours and wheels are available on model displayed. Please see your dealer or visit Build & Price for full option details. 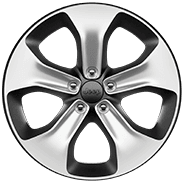 19-inch polished aluminum with Gloss-Black pockets Image for representation only. 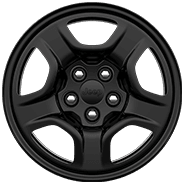 Not all colours and wheels are available on model displayed. Please see your dealer or visit Build & Price for full option details. Find out what it took to create the sleek, confident look of the Jeep® Compass. Find out what it took to create the sleek, confident look of the Jeep® Compass. 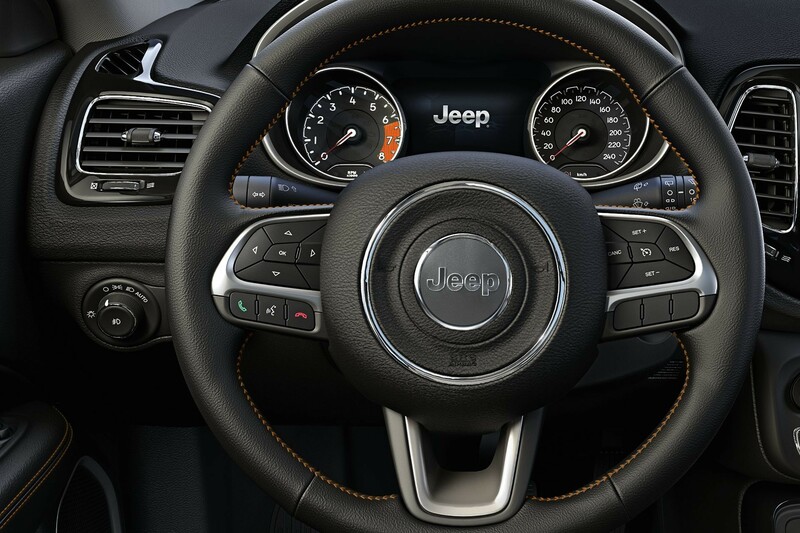 Our Jeep® Brand designers share their inspiration and motivation in this special video. 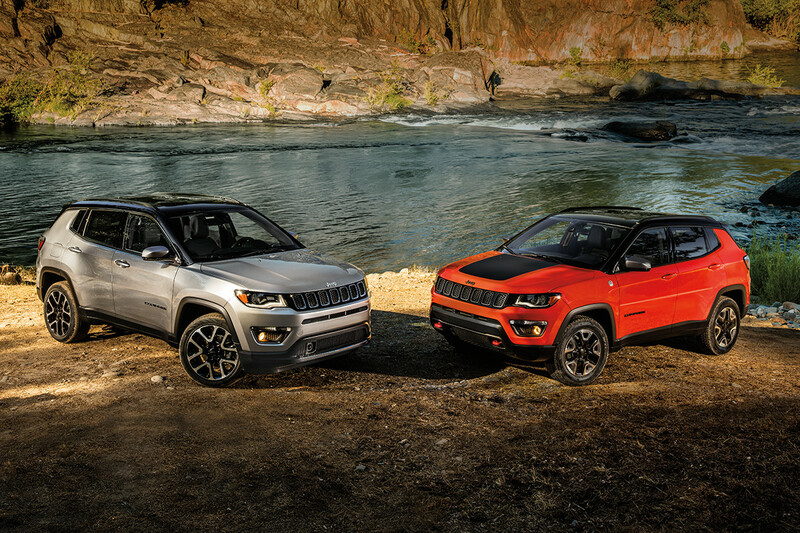 These 2 models beautifully represent the latest iteration of legendary Jeep® Brand design. 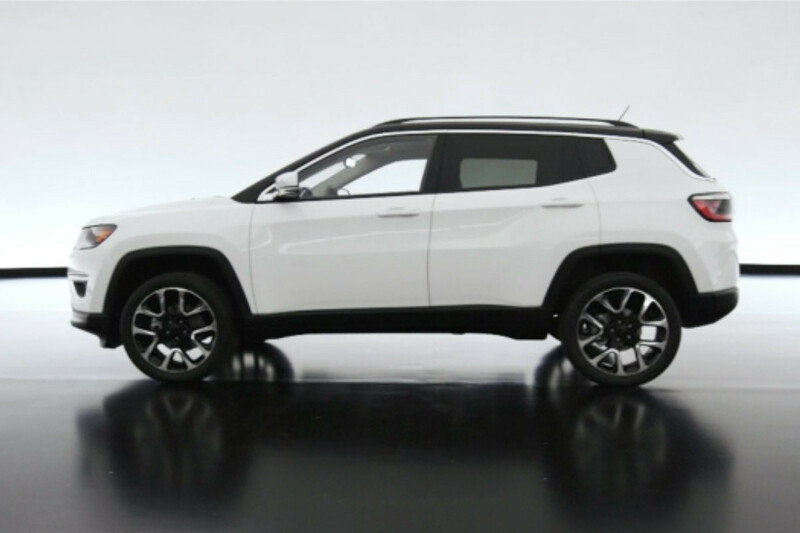 The Compass Limited radiates a modern, urban vibe with its fluid lines, unique Gloss Black painted roof and dramatic wrap-around chrome moulding. 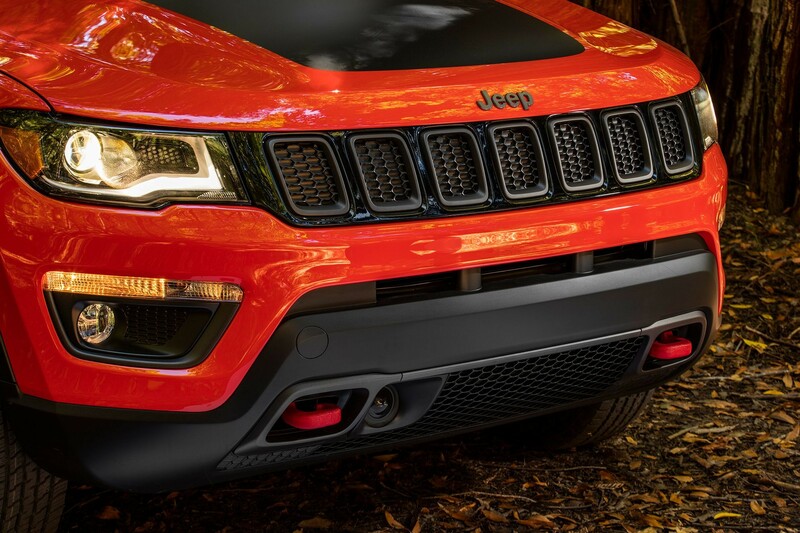 The aggressive look of the Trail Rated® Trailhawk® includes the signature Trailhawk red tow hooks and black anti-glare hood decal. Explore confidently and in style with Best-in-Class approach, departure and breakover angles. 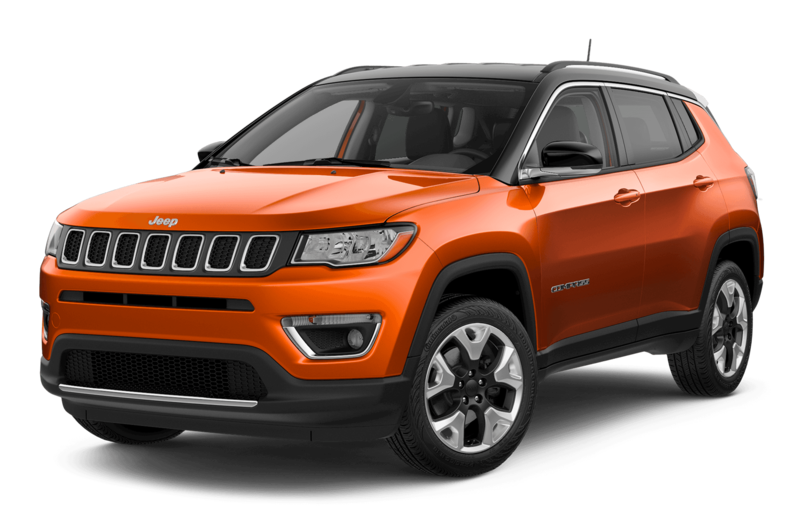 Based on Jeep’s sub-segmentation based on compact sport and cross utility vehicles including Chevrolet Trax, Mitsubishi Outlander, Subaru Crosstek, Hyundai Tucson, Kia Sportage, Mazda CX3 and Volkswagen Tiguan. Best-in-Class 4x4 capability based on Jeep Active Drive Low 4x4 system. Standard and available headlamps light the way wherever you venture. 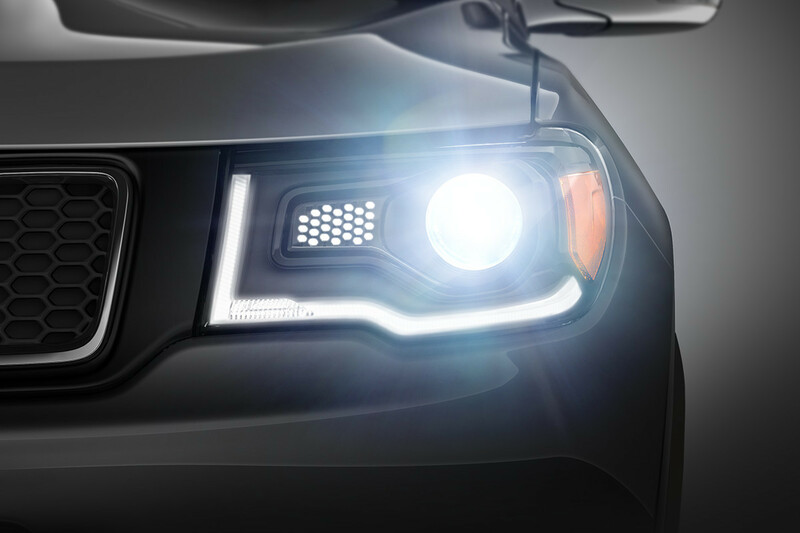 Available Bi-Xenon High Intensity Discharge projector beam headlamps illuminate automatically when it gets dark. Activate the available cornering front fog lamps by turning the steering wheel or engaging the turn signal, sending more light toward the direction you're heading. 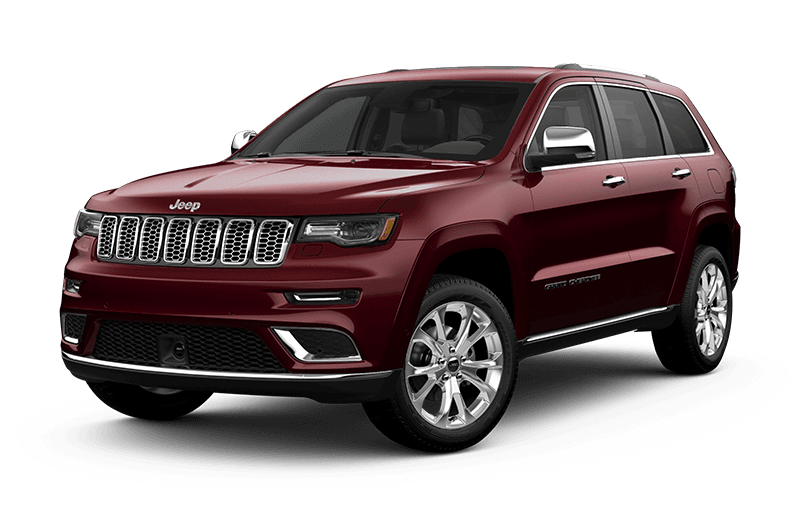 Standard on North, Trailhawk® and Limited models. 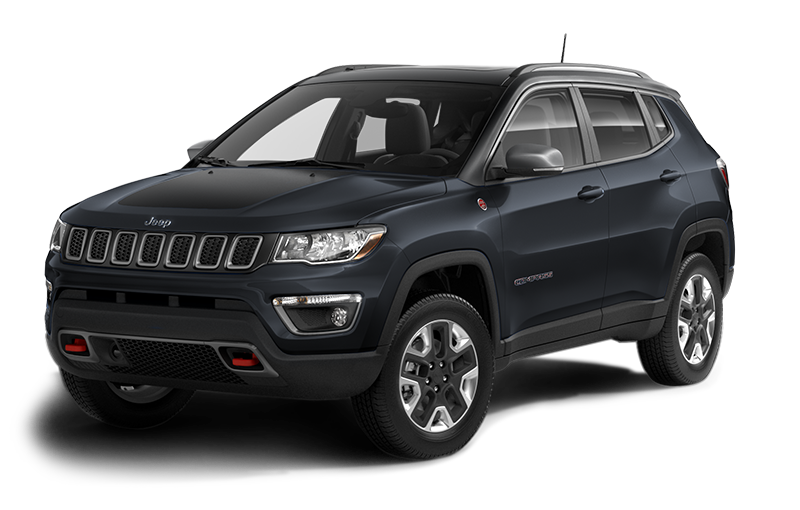 The Compass Trailhawk® delivers Best-in-Class 4x4 Capability Based on Jeep's sub-segmentation based on compact sport and cross utility vehicles including Chevrolet Trax, Mitsubishi Outlander, Subaru Crosstek, Hyundai Tucson, Kia Sportage, Mazda CX3 and Volkswagen Tiguan. Best-in-Class 4x4 capability based on Jeep Active Drive Low 4x4 system and Best-in-Class approach angle, departure angle and breakover angle. thanks to exclusive features. 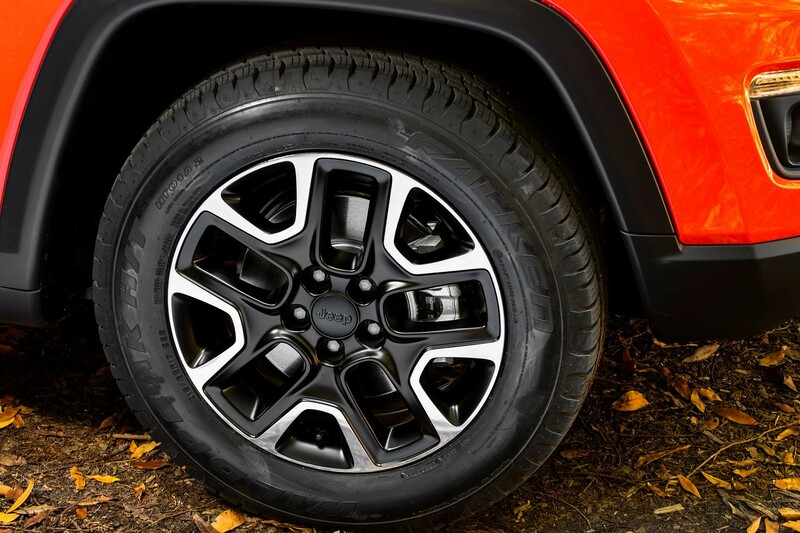 The Jeep® Active Drive Low 4x4 system offers torque management to seamlessly transfer additional power to any wheel for greater traction. 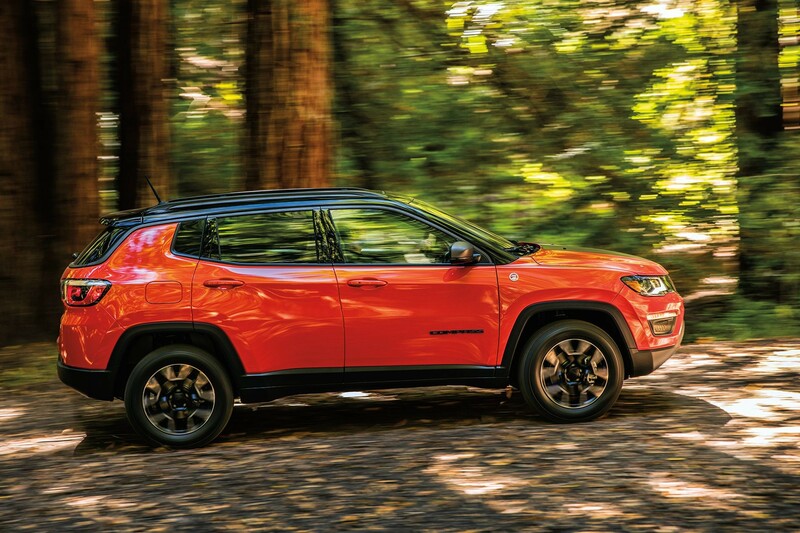 As well, off-roading benefits from a crawl ratio of 20:1, allowing the Compass to climb steep hills with ease. 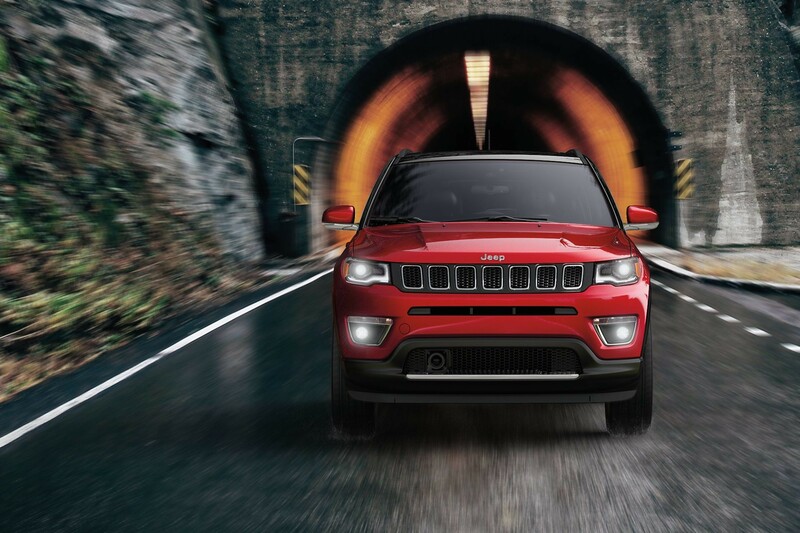 Hill Descent Control, also exclusive to Trailhawk®, monitors throttle, speed and braking on steep slopes, allowing you to focus on steering when navigating downhill paths. 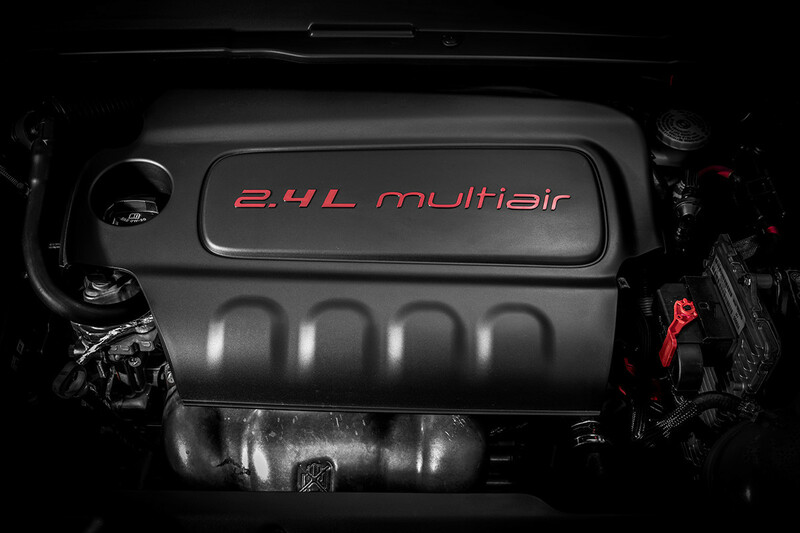 The standard 2.4L Tigershark® MultiAir® I-4 engine is both powerful and efficient. 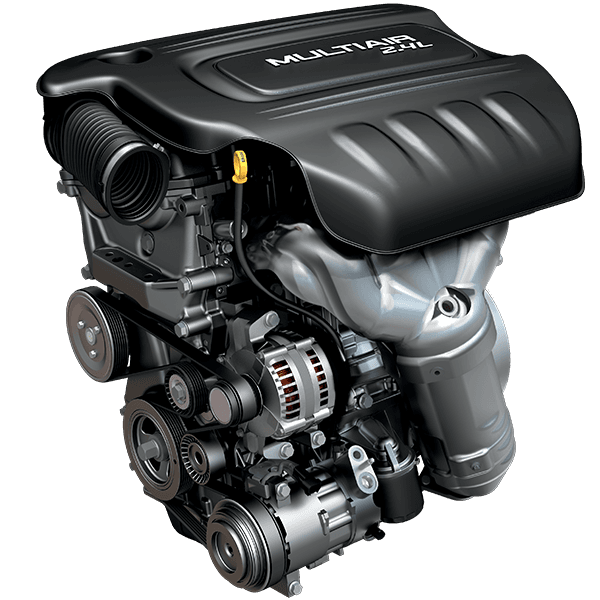 The standard 2.4L Tigershark® MultiAir® I-4 engine is both powerful and efficient. It outputs 180 horsepower, 175 lb-ft of torque and provides a towing capacity up to 907 kg (2,000 lb). When properly equipped. 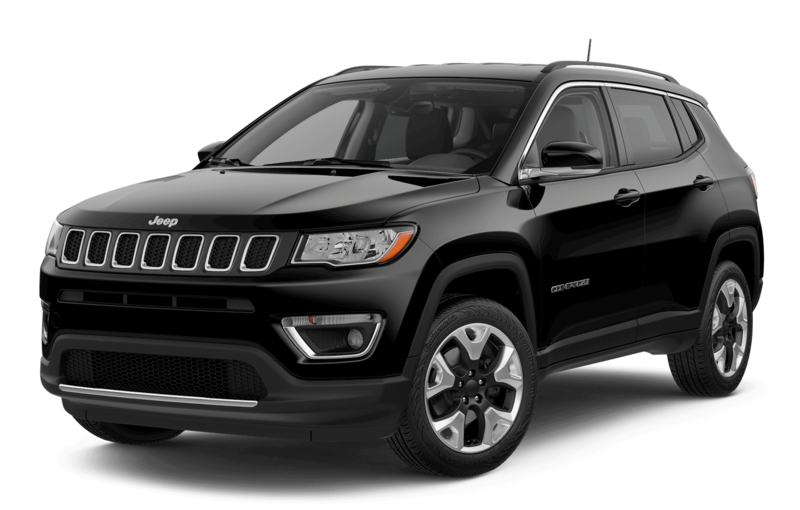 Sport models come standard with 6-speed manual transmission; a 6-speed automatic is available on 4x2 models and the Class-Exclusive 9-speed automatic Based on Jeep's sub-segmentation based on compact sport and cross utility vehicles including Chevrolet Trax, Mitsubishi Outlander, Subaru Crosstek, Hyundai Tucson, Kia Sportage, Mazda CX3 and Volkswagen Tiguan. 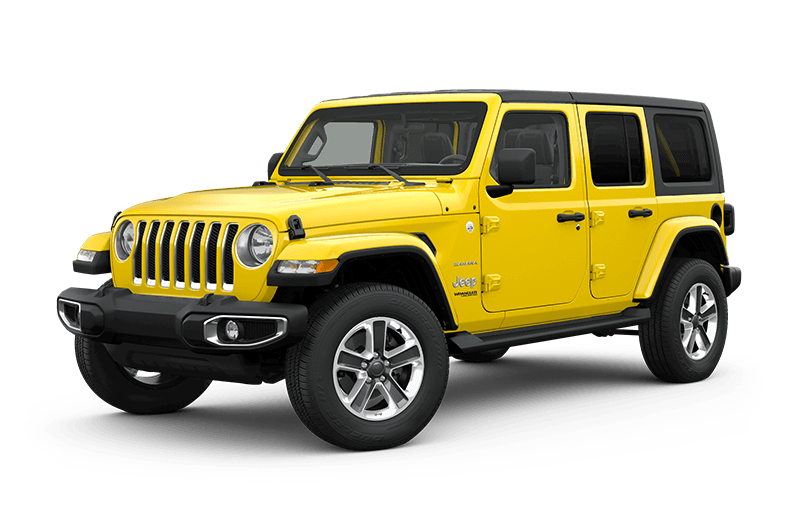 is available on 4x4 models. 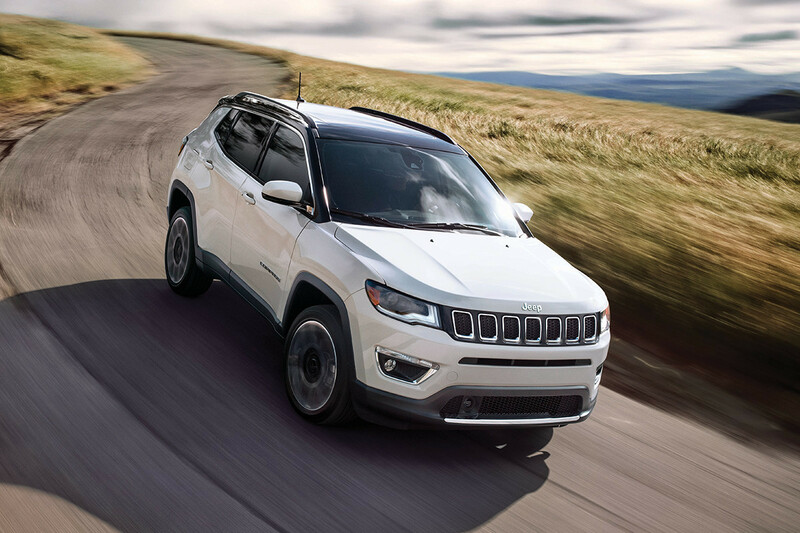 The 2018 Compass provides impressive fuel-efficient performance using advanced technology. Fuel-saving Engine Stop/Start (ESS) technology is standard with the automatic transmissions. It shuts the engine off when the vehicle stops, then starts the engine again when the brakes are released. 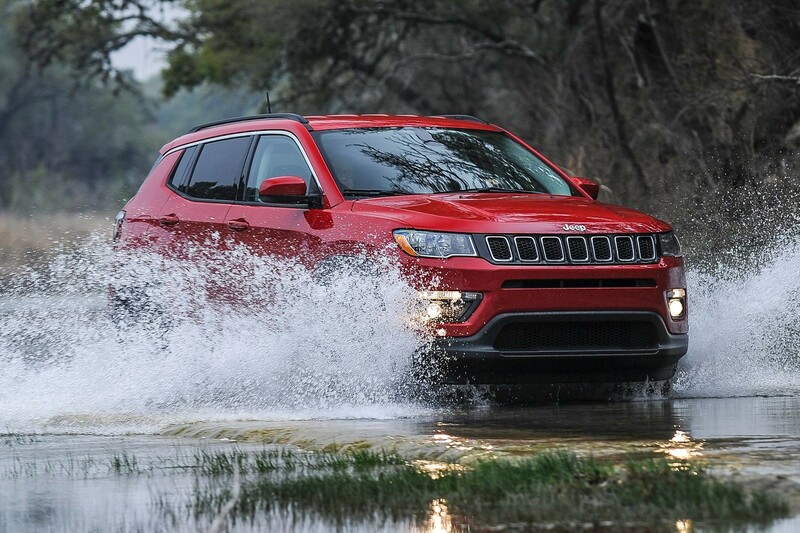 The available Jeep® Active Drive 4x4 System provides 4x4 capability without sacrificing efficiency. 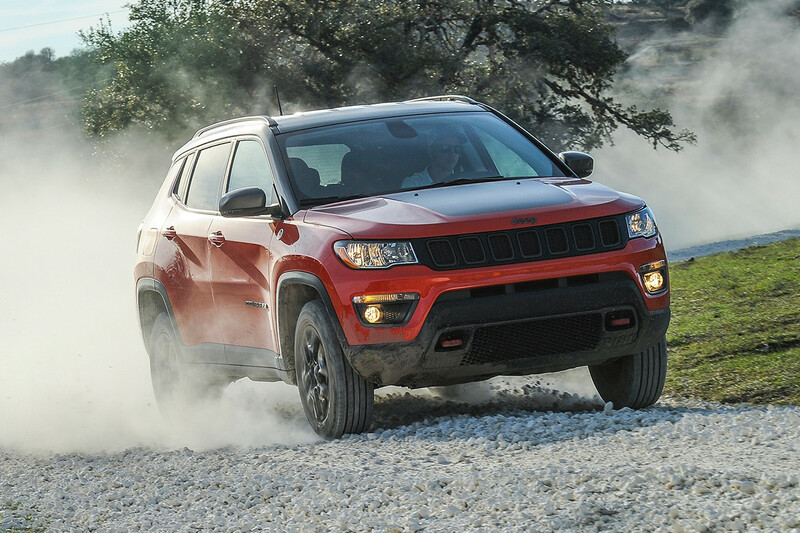 It seamlessly switches between two- and four-wheel drive at any speed when 4x4 capability isn't needed. 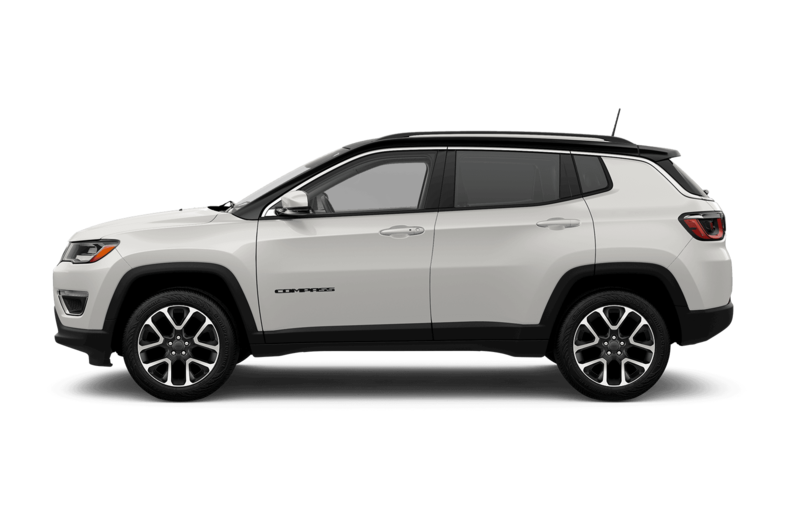 The 2018 Compass delivers a refined, dynamic ride on par with luxury-class vehicles. 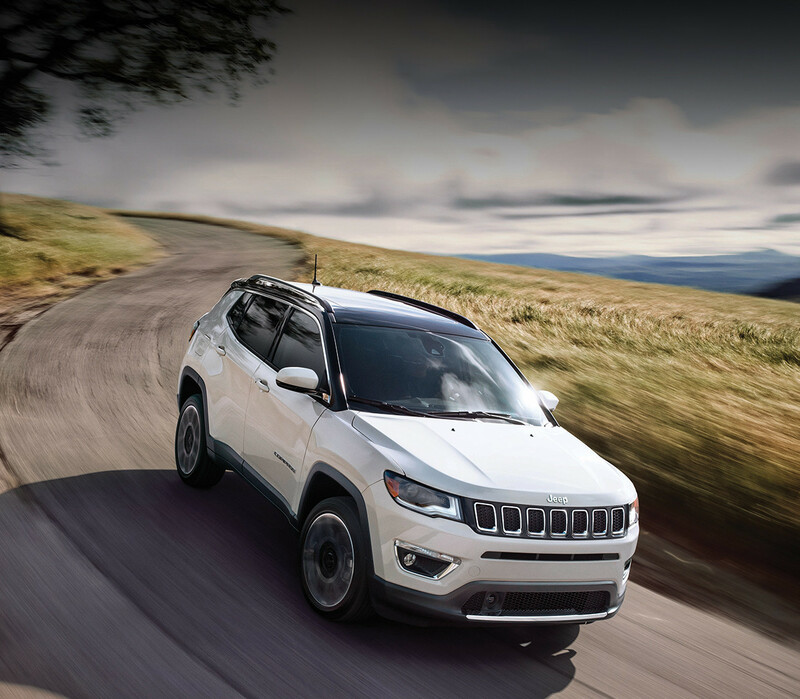 From rural roads to modern highways, the 2018 Compass is designed to deliver an impressive ride. Premium mechanics support precise steering, while MacPherson struts and frequency-sensitive dampening allow for a smooth ride. 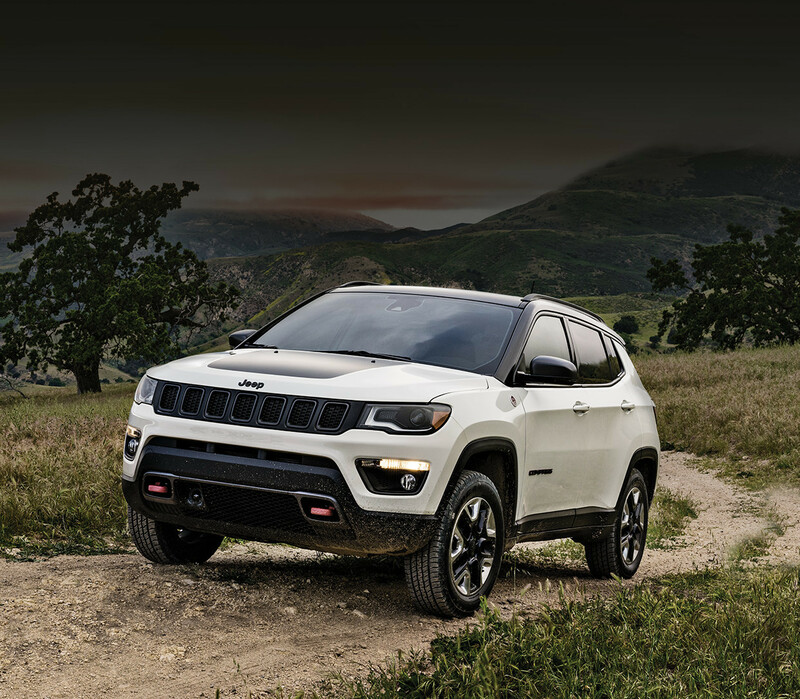 Every Compass equipped with an available 4x4 system comes with the Selec-Terrain® Traction Management System, built to tackle Mother Nature's toughest conditions. 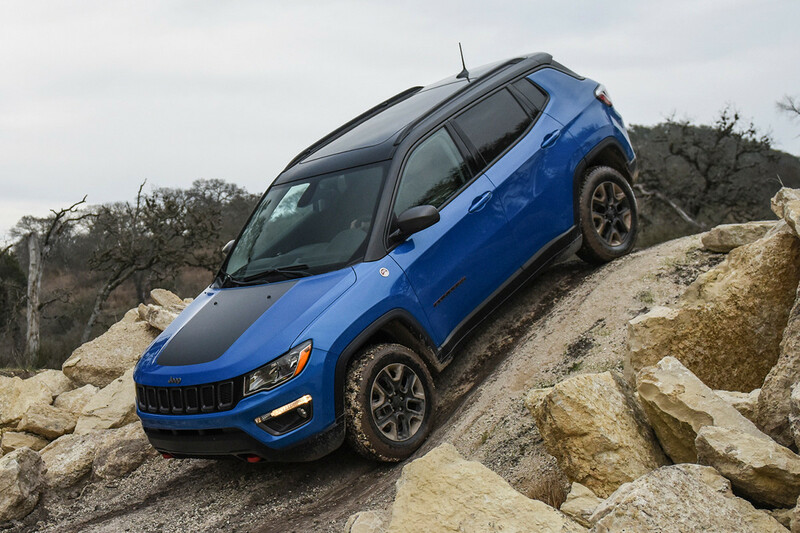 Choose from up to 5 sure-footed modes: Auto, Snow, Sand, Mud, and exclusive to Trailhawk®, Rock. 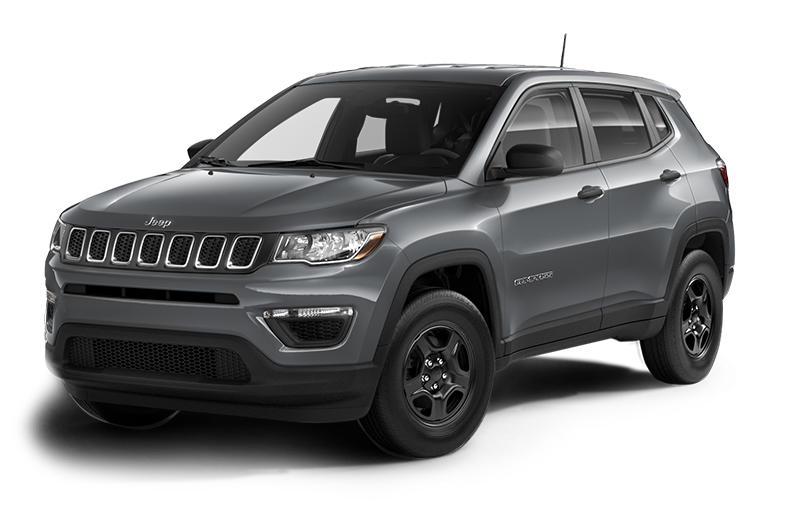 Standard in all Compass models, this engine delivers 180 horsepower, 175 lb-ft of torque and a towing capacity up to 907 kg (2,000 lb). When properly equipped. 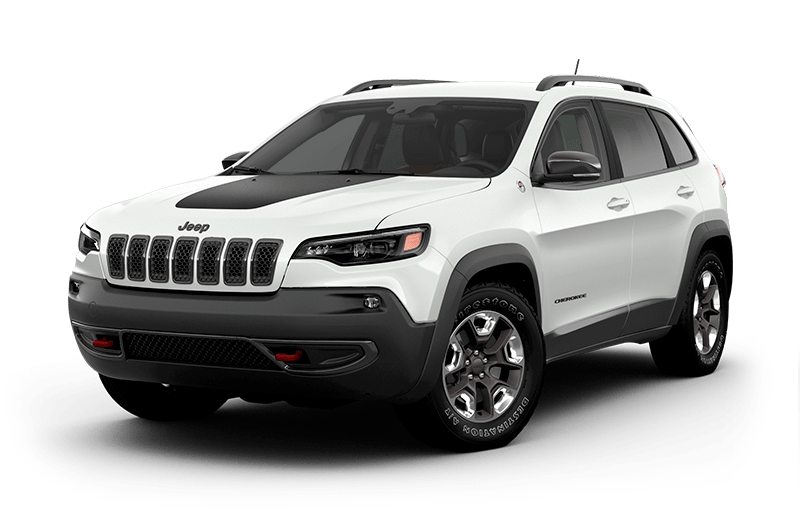 The foundation for the 2018 Compass all-encompassing safety promise is its unibody structure. The foundation for the 2018 Compass safety promise is its unibody structure. 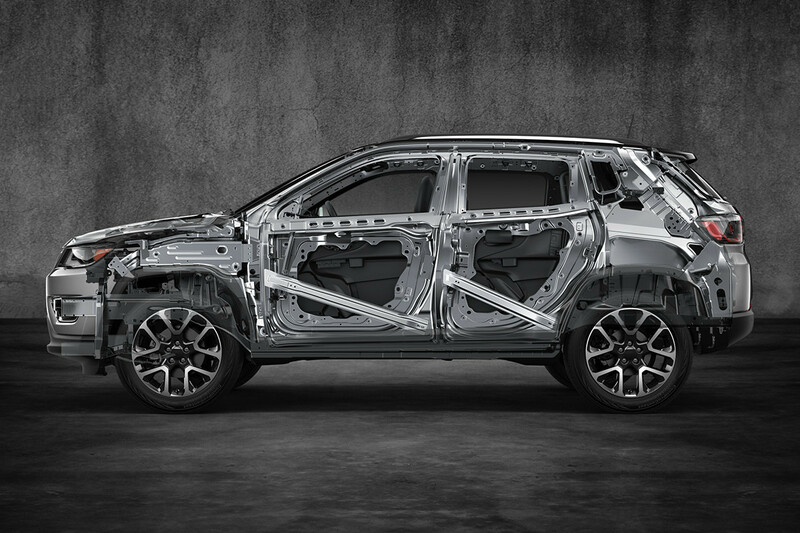 This “safety cage” design combines high-strength steel with other advanced materials to create a strong, protective shell around the vehicle’s occupants to protect everyone on board. 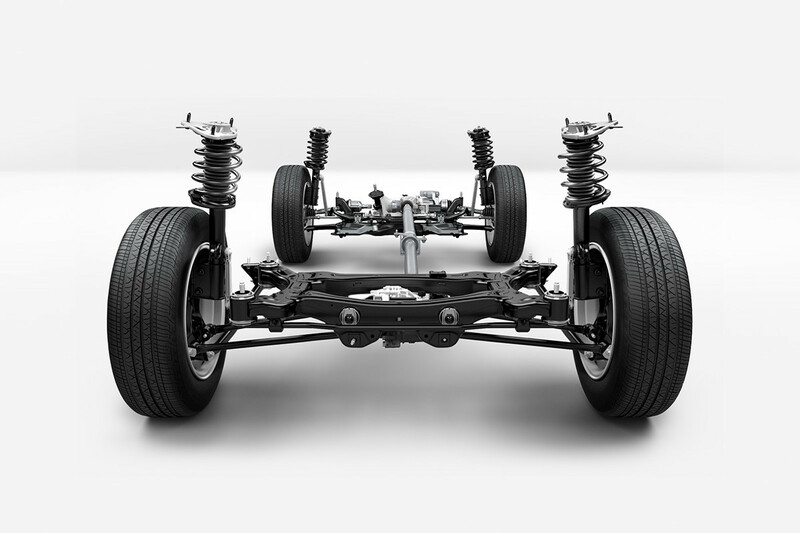 The advanced 4-Wheel Antilock Braking System helps ensure control while braking. The advanced 4-Wheel Antilock Braking System helps ensure control while braking. It continually evaluates road conditions for optimal engagement and stopping distances. 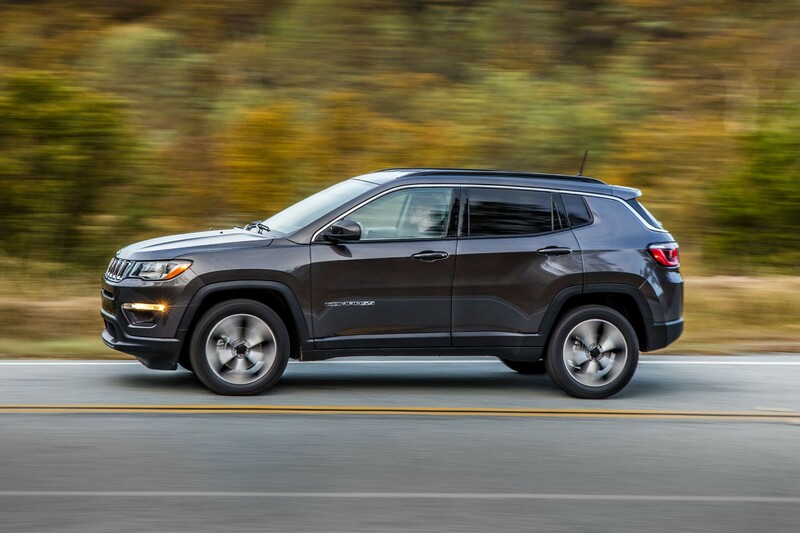 This standard system includes Rain Brake Support, Hill Start Assist and all-speed traction control, all working together to help maintain vehicle control during emergency braking. 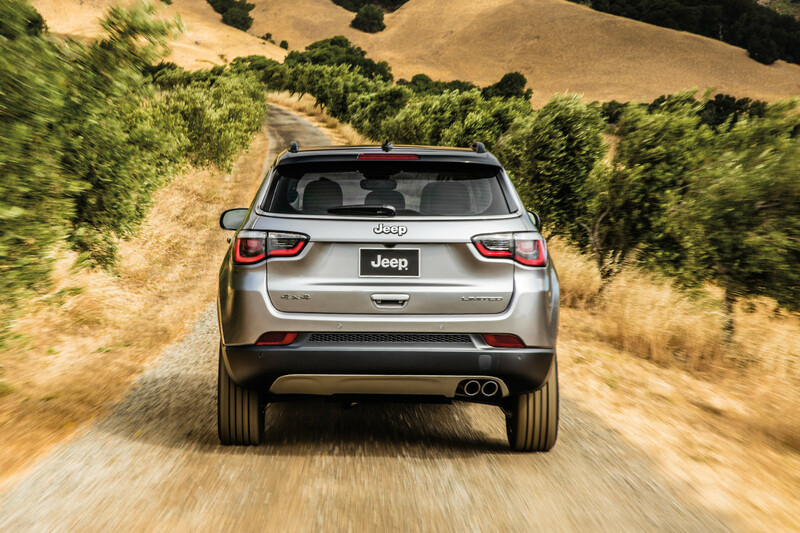 These 2 advanced technology features help you keep your Compass safely on track. 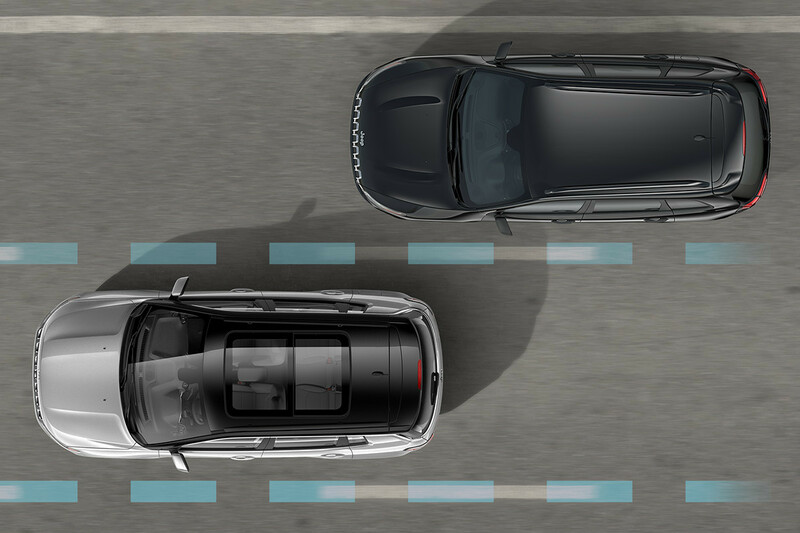 The available Lane Departure Warning with Lane Keep Assist This is a driver convenience system, not a substitute for active driver involvement. The driver must remain aware of their surroundings and be prepared to take corrective action to avoid collisions. measures your vehicle’s position within lane boundaries. If it detects an unintentional lane drift, it can warn you and gently nudge your vehicle back into the proper lane. system This is a driver convenience system, not a substitute for active driver involvement. The driver must remain aware of their surroundings and be prepared to take corrective action to avoid collisions. alerts you when it senses potential front impact. If you don’t respond and the risk continues, the system can automatically engage the brakes. 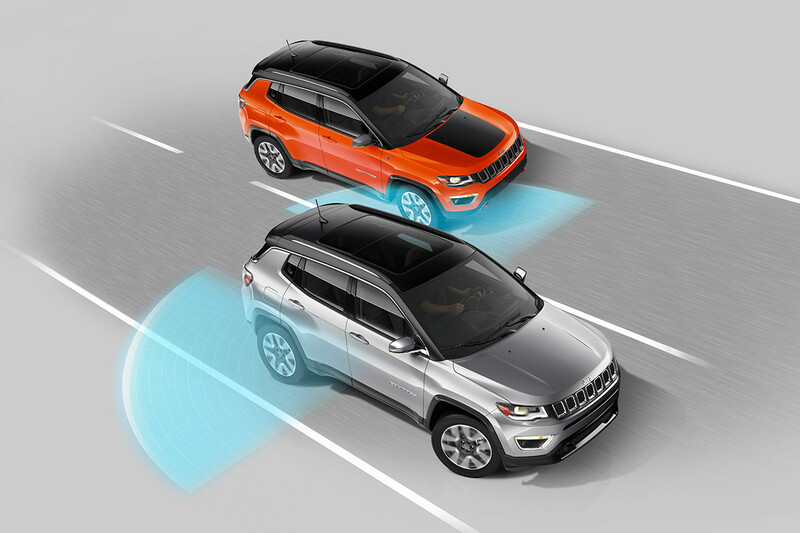 These 2 available safety features provide extra eyes on traditional driver blind spots. When you signal to change lanes, the Blind-Spot Monitoring This is a driver convenience system, not a substitute for active driver involvement. The driver must remain aware of their surroundings and be prepared to take corrective action to avoid collisions. system can warn you with an audible alert and visual icon on the sideview mirror if there’s a vehicle in your blind-spot area. Rear Cross-Path Detection This is a driver convenience system, not a substitute for active driver involvement. The driver must remain aware of their surroundings and be prepared to take corrective action to avoid collisions. can help you safely reverse from a parking spot by warning you of any vehicles or pedestrians approaching from either side. WITH OPTIONAL FRONT CRASH PREVENTION; APPLIES ONLY TO VEHICLES BUILT AFTER DECEMBER 2016. 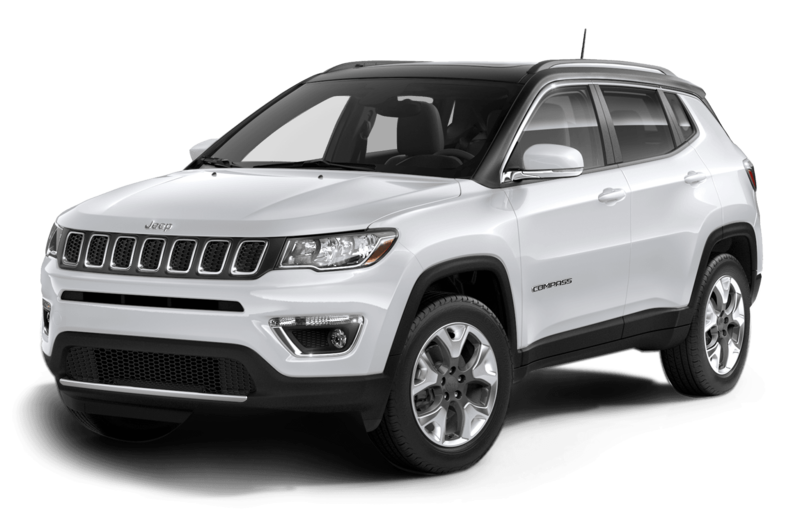 Most Capable Compact SUV Ever Most Capable Compact SUV Ever is based on historical U.S. unibody C-SUV segment competitors as identified by 2016 CY WardsAuto Small Cross/Utility Vehicle SUV segment (years 1985-2017). 4x4 capability based on Jeep Compact SUV offering low range power transfer unit (PTU) with 21:1 crawl ratio, low range 4x4 capability. This claim excludes all FCA vehicles.